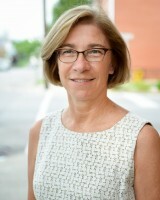 Weidinger serves as President & CEO of Brighton Center, Inc., a comprehensive community-based non-profit based in Northern Kentucky with an annual budget of $11M. Brighton Center’s mission is to create opportunities for individuals and families to reach self-sufficiency through family support services, education, employment, and leadership. Ms. Weidinger’s 37-year history at Brighton Center began with front line work with individuals & families and led to her current position. She oversees agency policy implementation, strategic planning, Board development, budget preparation, evaluation, and program development, all with a focus on fulfilling Brighton Center’s commitment to the community. She also represents the organization and advocates for the customers of Brighton Center on a variety of community Boards, committees, and task forces. Ms. Weidinger holds an MSW from the University of Kentucky. As a nonprofit organization based in Greater Cincinnati, The Health Collaborative has positioned itself as a progressive national leader in health and healthcare transformation. The unique composition of its Board of Directors has even been lauded for its diversity and efficacy: it was honored by the Cincinnati Business Courier in 2016 with an Outstanding Board Excellence award, recognizing exemplary dedication and performance.